Pitching in front of your dad can be nerve-racking. Pitching in front of your dad on Father’s Day, well, that’s on another level. 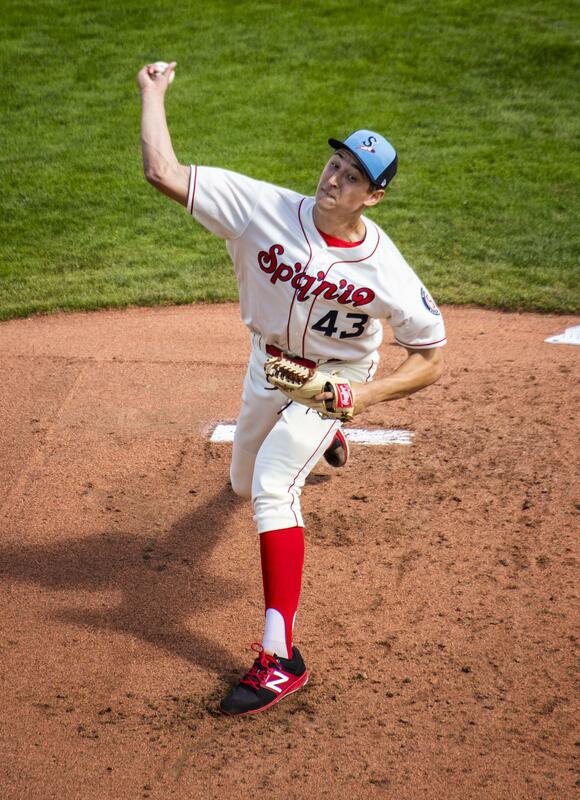 But Spokane Indians’ right-hander Tai Tiedemann not only handled it well on Sunday, he even enjoyed it. Tiedemann gave up one earned run on three hits and two walks across four innings with two strikeouts against Boise for a meaningful showing in front of his family. Though the Indians lost 9-3, Spokane was ahead when Tiedemann left the game. “It means the world to me. I love pitching in front of them and showing them what I’m here to do and what I love to do,” said Tiedemann shortly after the game. Tiedemann and his father, Rick, endured a lot together prior to Tai’s getting picked by the Texas Rangers in the eighth round of the 2016 MLB Draft. Before dedicating himself to the baseball full-time, Tiedemann was the starting quarterback for his high school football team and worked closely with his father to hone his skills. Playing football each of his four years of high school became a hulking responsibility that overrode his time to play baseball. But after he played his final game on the gridiron his senior year, his mother made what would turn out to be a life-changing request: return to the diamond and play baseball for one final season. “After one season, he realized how much he missed it and (he) turned down a football scholarship to Manhattan College,” said mother Mimi Tiedemann. Shortly after high school, Tai Tiedemann attended Long Beach City College to play baseball and carved up the local league as the team’s starting center fielder. In his sophomore year, he immersed himself into the world of pitching and struck out 62 batters across 80 innings with an ERA of 2.59. He also hit .357 with 28 RBIs. It didn’t take long for him to be named the 2016 South Coast Conference player of the year and catch the eye of Rangers scouts during the draft. His parents “were obviously really happy, but for (his dad) to hear my name called, it was a very emotional and exciting moment,” Tiedemann said. The complete Tiedemann family didn’t dare to think of missing his season debut, even after a delayed flight, a canceled flight, and various other travel troubles. “It’s the only thing he wanted to do for Father’s Day,” Mimi Tiedemann said of her husband. It might have even been more important to Tai Tiedemann. Published: June 17, 2018, 9:34 p.m.